Top 2013 NHL Draft prospect Nathan MacKinnon highlights the team the Quebec Major Junior Hockey League will use for its games against Team Russia in the 2012 Subway Super Series. The two games between the Russians and Team QMJHL will be held Nov. 5 at the Centre d'Excellence Sports Rosseau in Boisbriand, Que. -- home of the Blainville-Boisbriand Armada -- and Nov. 7 at Centre air Creebec in Val-d'Or, Que. -- home of the Val-d'Or Foreurs. 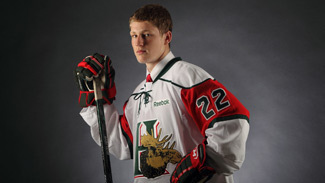 MacKinnon, a center with the Halifax Mooseheads, has 11 goals and six assists in 10 games. He is considered by many scouts as a lock to be the first or second player picked in the 2013 NHL Draft. "His skill level with the quickness with which he can execute, read and react -- there aren't many players who can do that," Director of NHL Central Scouting Dan Marr said. MacKinnon is one of four skaters who earned "A" ratings in Central Scouting's preliminary rankings of players to watch for this year's draft who will play for Team Quebec. Two of them are MacKinnon's teammates in Halifax, goaltender Zachary Fucale and left wing Jonathan Drouin, along with Cape Breton Screaming Eagles center William Carrier. Fucale, a 6-1 1/4, 181-pound netminder, is 7-1-0 in eight games; he is sixth in the league with a 2.22 goals-against average and tied for seventh with a .906 save percentage. The 5-10 3/4, 185-pound Drouin has five goals and 10 assists in just seven games. Carrier leads his team with 17 points and 11 assists in 11 games. Another player to watch is Rouyn-Noranda Huskies center Jean-Sebastien Dea, who leads the QMJHL with 15 goals and 23 points in 11 games. Two NHL first-round picks also were selected for Team QMJHL -- Saint John Sea Dogs center Jonathan Huberdeau and Victoriaville Tigres center Philip Danault. Huberdeau was drafted by the Florida Panthers with the third pick of the 2011 draft, while Danault went to the Chicago Blackhawks at No. 26. For the game in Boisbriand, Rouyn-Noranda coach Andre Tourigny will coach the team, with Drummondville Voltigeurs coach Mario Duhamel and Blainville-Boisbriand coach J-F Houle serving as assistant coaches. For the game in Val-d'Or, Tourigny will serve as coach, with Duhamel and Val-d'Or coach Mario Durocher serving as assistant coaches. After the games against Team Quebec, Team Russia will play a pair of games against Team OHL (Nov. 8 and 12) and Team WHL (Nov. 14-15).